Now open at LEA17 is The Philosopher's Stone, created by Pixels Sideways and Georg Janick, featuring works by sixteen artists. 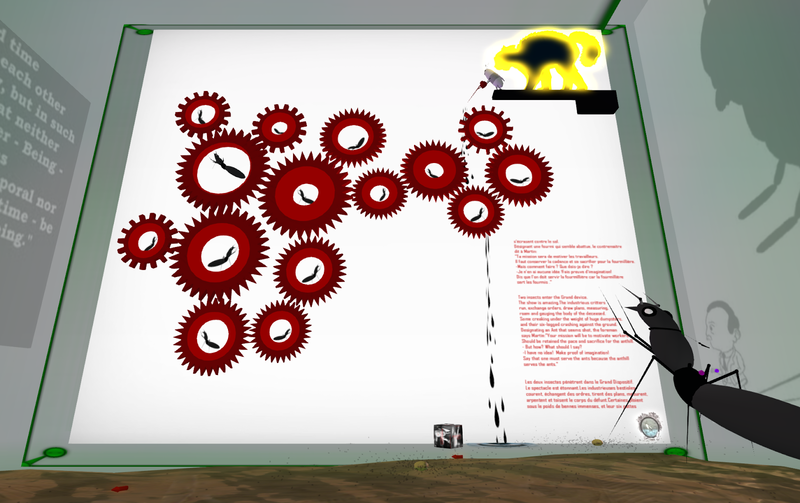 Pixels has written a thorough and very readable blog post of her own about the installation on the Linden Endowment for the Arts blog, describing the process of how the concept came to be. Suffice it to say here that Pixels and Georg "came up with the idea of having a group of artists 'interpret' a philosopher/philosophy" and then selected fifteen seminal philosophers and paired them randomly with fifteen invited artists. Additionally, Pixels created several scenes on broad philosophical subjects. The results, not surprisingly, are strikingly varied, and many of the creations are delightful and absorbing. Upon arriving at The Philosopher's Stone, you'll be at the ground level, featuring works by Pixels — "there are several places to explore that cover general ideas such as the Philosophy of Love, The Sisyphus Challenge (The Philosophy of Struggle), Philosophy of Media and Politics and other installations I created," she explains. 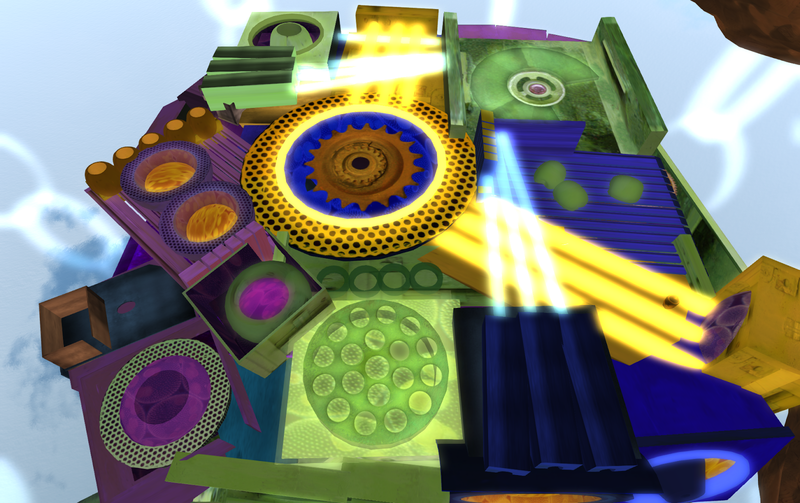 Many items on this level are interactive, and the amphitheatre will be home to future events. (After you manage to climb Sisyphus's hill, avoiding the boulders, look around for the secret teleport in the temple, which takes you down into the area shown on the first image.) The ground level also features some two-dimensional works by the invited artists. 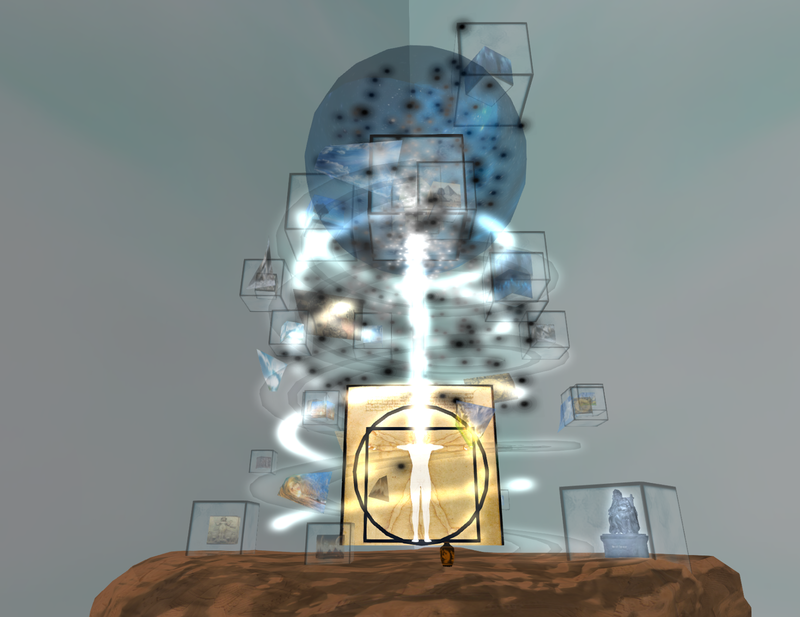 To reach the larger, three-dimensional works, each on its own island in the sky, click on the Greek vase at the landing point, which serves as a teleport. (You'll see these throughout the installation.) After reaching one of the islands, you should be able to fly about easily to visit them all, and the parcel description will change as you move about, telling you whose work you're visiting. 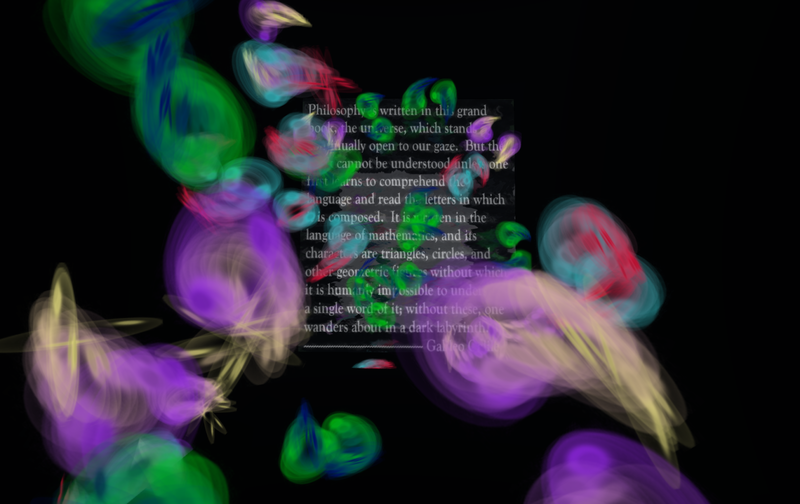 Some give us texts to read, many give us things about which to think, some contain bits of humor (Aequitas's Plato give me a laugh), and all of them invite us to learn more about their respective philosophers. (While I've studied works by most of them, I must admit to feeling the need to brush up on my reading!) The Philosopher's Stone will remain on display through April or possibly into May — Pixels may produce an additional exhibition prior to the end of her LEA grant.